Siargao has become popular due to its world-class, year-round waves, picturesque views, and warm lush environment. With lots of great places to visit and things to do in this teardrop-shaped island, a relaxing place to come home would be very rewarding. #1 - Isla Cabana Resort: Spoil yourself in one of the most luxurious resorts in Siargao situated in a private beach with spacious cottages. Every corner of the resort is definitely Instagram-worthy with outdoor landscapes. It also features luxurious amenities such as infinity pool, spa, kayak, beach bar, pool table, fitness gym, and an amazing beachfront. #2 - Harana Surf Resort: Be serenaded by the excellent service and first-class accommodation that this resort offers at a competitive price. Rooms are designed like Filipino traditional homes with a vernacular design. It is located near a not-so-popular surf break called Tuason that is perfect for intermediate to advanced surfers. #3 - Bayud Boutique Resort: Detach, unwind, and relax in this resort tucked in a long quiet stretch of white-sand beach that would let you enjoy nature at its finest. The cultural and hip island vibe is very much present with murals done by some of the best artists. The 11 spacious villas made with wood adds up to the charm. Surfing Pig, its in-house restaurant showcases the Filipino cuisine. 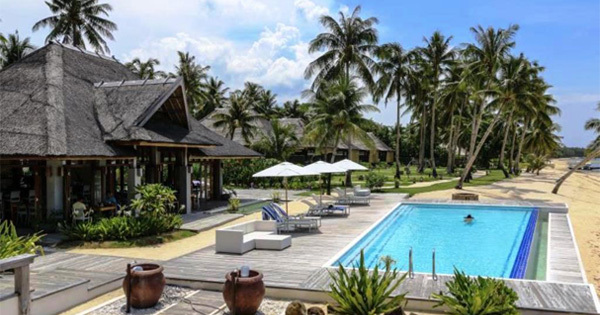 #4 - Bravo Beach Resort: Experience authentic island lifestyle in this resort that claims to be every surfer's paradise. Offering rooms with options from cozy garden rooms to secluded double rooms to shared surf bunks, there's always something for everyone. It also features a plunge pool, a restaurant, and a beach overlooking the Pesangan Reef and the Pacific Ocean. #5 - Kalinaw Resort: True to its name (Kalinaw means "peaceful" in Visayan), you'll definitely get to have the peace and comfort you deserve. It has five cottages: four deluxe villas facing a lagoon and one pool-suite villa secluded from the rest of the resort. It has its own oceanfront but it is also just 10 minutes away from the famous Cloud9. #6 - Paglaom Hostel: If you are in to experience more of the community's family vibes, this homie hostel with clean dormitory rooms is the best place to stay. It's very easy to make friends in the common area where free wi-fi is also available. There is also a spacious kitchen where you can cook your own food, which means even more savings!